This photograph shows Governor Mark Parkinson signing HB 2195, an act relating to maintenance and certification of electronic state government records. 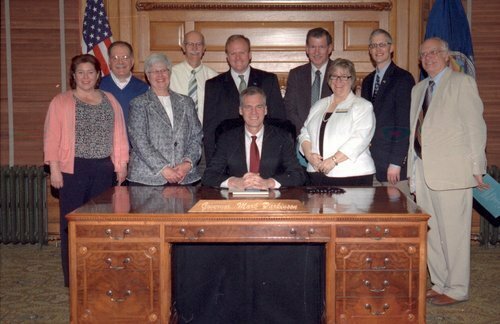 People in the photograph are front row (left to right): Terri Clark, Assistant Director, Legislative Computer Services; Pat Michaelis, Director, State Archives & Library, Kansas State Historical Society; Governor Mark Parkinson, Kansas Governor; Jennie Chinn, Executive Director, Kansas State Historical Society; Don Heiman, Legislative Chief Information Technology Officer; and back row (left to right): Carey Brown, Kansas Information Technology Office; Joe Hennes, Executive Chief Information Technology Officer; Rep. Mike Burgess, Kansas House of Representatives; Bill Roth, Chief Information Technology Architect, State of Kansas; and Matt Veatch, State Archivist, Kansas State Historical Society. Matt Veatch, State Archivist, Kansas State Historical Society. People - Notable Kansans - Parkinson, Mark V.